The scariest thing about the Warped Wall is not ‘Can I get to the top?’ it’s ‘What’s going to happen if I don’t make it?’. Well, that, and it’s as daunting as hell. I’d strongly suggest getting in some warped wall practice if you can… even if it means traveling – don’t make the first one you ever see be when you’re on the show. 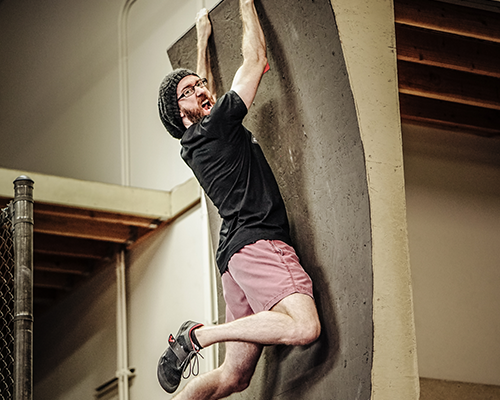 So much of the Warped Wall is the mental game and the technique. When you see one for the first time, the first thing to do is practice your exit strategy. Either run up to a point and turn around and come back down… or run up to a point and then put your hands on the wall and back down in a controlled way. You want to build the muscle memory for the times when you won’t make it. Once you’ve got that sorted, the fear and the mental game will be so much easier to manage. Spread your arms and legs, make constant contact and throw your hips forward. This prevents you from falling backward and is the safest exit from the obstacle. I got into the nasty habit of turning around at the top when I bailed. The problem with this is that you come back down too fast, and when you hit the floor that isn’t curved your legs might be ready for it. If anyone bites it, they crash like a metre away from the Warped Wall. Turning around also prevents you from actually making it, because you have to turn before you’d hit the top – so you have to decide to fail before you have a chance to succeed. My first ever attempt took me 4 goes to get to the top. It’s way harder than it looks on TV… and it looks crazy hard on TV. You want to take 3 steps once you hit the incline. Step with your strongest leg, step with the other, then as you step with your strong leg, you actually leap upwards with that leg. Keep facing the wall and reach up with both hands. The inclination is to either put one hand on the wall, or start to turn your body away from the wall… both of these are bad. You’ll only catch it with one hand, which is a lot of weight and force to place on a single limb. Instead, keep facing the wall and reach up with both hands. You won’t hit your face like you think, because the wall is curved and the point to grab onto will jut out. Once you’ve got the edge with both hands, rock climbers will get a leg up, but the rest of us will need to get an elbow up to give us the leverage to pull ourselves up. From the two handed grab position, lift yourself enough to get your elbow on the platform, and use that elbow as a lever to get your chest up. Once your chest and belly are at about the line height, you should be able to get yourself up, over and pressing that buzzer! Five Star Fitness (NSW) – Goes up into the roof – so cool! Burns Outdoor Obstacle Training (NSW) – Outdoors and super fun. Any others? Please comment below. I would love a Salmon ladder how to. Both up and down :p.
It’s crazy how much variety there is training on different warped walls. The steepness and curve changes so much from wall to wall and can make the wall either easy or terrifying. Great idea! I’ve got a lache post coming and then after that I’ll do the Salmon Ladder. I’ve been on quite a few Warped Walls, and I’d say the height is almost irrelevant, it’s the steepness and the texture of the materials that’ll get you. That first video is a 16ft wall (4.8 meters) with a gentle incline but the other one is 14ft and much harder/scarier. They were in kogarah before and just moved, grand opening on the 5th of august. Can’t wait! Warped Wall (14ft) – Lee’s Gym, Manuka ACT. 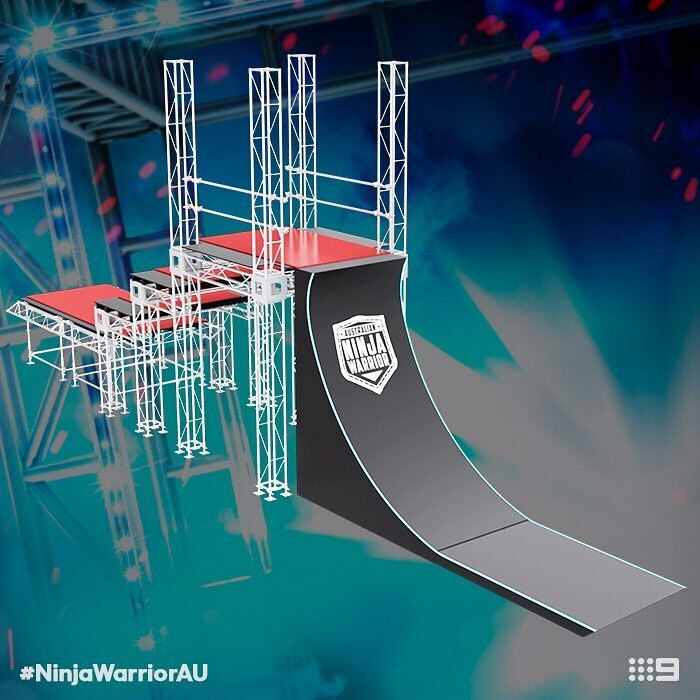 Does anyone know how to find the dimensions of the warped wall without having to pay for blue prints? In particular I am interested in what the radius of the curve is supposed to be. → Ninjas In Training : K9 Ninja!